An Israeli specialist and his research team have made a “radical and potentially life-changing” discovery. It’s something that could help produce a cure for all forms of cancer. This incredible breakthrough is the result of a 16 year long study of the only known creature immune to cancer— the mole rat. Professor Aaron Avivi and his team discovered that specific cells found in the mole rat secrete a substance which actually overwhelms and kills cancer cells in various mammals. Theoretically this means you and me! If they can devise a way to harvest this substance and render it safe for our consumption, that could spell an end to the worldwide cancer epidemic as we know it. The professor took a truly unique approach to studying two species of rat (the blind mole rat and its cousin the naked mole rat). Both live the vast majority of their lives under the earth. The team eventually learned that this particular lifestyle had caused a dramatic evolution in their metabolism. These mole rats live at least 20 years longer than other types of rodents– exhibiting no real signs of aging. Experts have never discovered a cancerous tumor on one of these creatures. 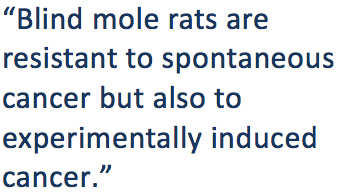 They exposed these lab rodents to two potent carcinogens over an extended period of time. Both the ordinary rats and mice developed cancerous tumors– the team found no tumors in the mole rats. The results have been described as “incredible” and “exciting” by leading minds in the field of oncology. It’s not the first time that researchers have examined creatures that exhibit natural resistance towards cancer. In fact, a study of sea creatures led to the development of the anti-cancer drug ­trabectedin. Scientists could also use this data to identify the genetic changes that have given the blind mole rat a lethal defense against cancer. That knowledge could then be used to modify our own genetic code. It’s still theoretical at this stage but the possibilities are exhilarating. Nearly 2 million people are diagnosed with cancer every year in the United States. The National Cancer Institute has shown that this number has been falling by 0.5% per year over the last decade. Still, these are millions of individuals and families that are in desperate need of a cure.